Ever had the problem of having a set of computers available but with no games to play on them? First world problems, I know. But that's another blog post altogether. I mean sure there are the giants that everyone has played at some point during their online multiplayer lives: Team Fortress 2, Minecraft, etc, but sometimes we crave something deeper and sometimes a bit more story-driven. I've compiled a list of games that I highly recommend for multiplayer co-operative play with your friends since it was so hard to find anything comprehensive on the internet. (This is written purely from a stand-point of PC gaming but many of these games are multiplatform). These are all Pay-To-Play, no ongoing subscriptions but you have to buy the game obviously - "Hey, sometimes you gotta fork out the wonga for fun". Who brings a lightsaber to a medieval reenactment, seriously? The clue is in the name, you defend dungeons in this addictive tower defense title. Your goal is to protect crystals from many waves of enemies that spawn from specific points and take specific routes towards the central point of your crystals. Your role is to place defense items such as turrets, barricades or traps and stop these enemies, all while controlling your specific character to fight (as you would in a third-person-action title) and repairing these defenses. The glorious part of the game is as you fight monsters you will gain experience points and level up, which allows you to assign skill points to boost your stats and, as a result, your defenses are improved. It's also worth saying that you can kit out your hero with store-bought or monster loot, whether he be an Apprentice (Wizard), Squire (Knight), Huntress (Archer), and Monk (Mixed-Bald-Guy). This is truly an addictive game and you'll find yourself carefully planning your strategy out with your friends between enemy waves and most likely trawling through the 50 pieces of armour and weapons that were dropped in the previous round of monsters. Truly a fun and satisfying zombie-destroying FPS that is extremely co-op friendly, the world is a lot less terrifying and lonely when you have some friends to help you bash in a zombie's head. This game extends beyond the usual run-and-gun of zombies, you're forced to rely more on the items you find readily available around you to survive and fight with: sticks, pipes, knives or, my personal favourite, the frying pan. There are 4 survivors and each has their own special set of skills that dictates which weapons they should focus on making a neat little collection of. Sam B, blunt weapons specialist; Xian Mei, favours the pointy weaponry; Logan Carter, throwing specialist, which means plenty of small knives and generally grenades should be his forte I suppose, and Purna, give this lady all the firearms. So pick whoever takes your fancy because you'll be sticking it out with them for a long time. You'll be having hours of fun completing quests, all in a bid to not only progress the average-story but mainly to amass a fortune so you can pimp-your-weapons and make them do ridiculous things like electrocute everything it hits. Parking was never my forte. Oh and did I mention there are vehicles? Zombie Roadkill. He only came over to ask for the time. "Hey, a weapon drop!" "Time to spend 10 minutes comparing weapon values!" 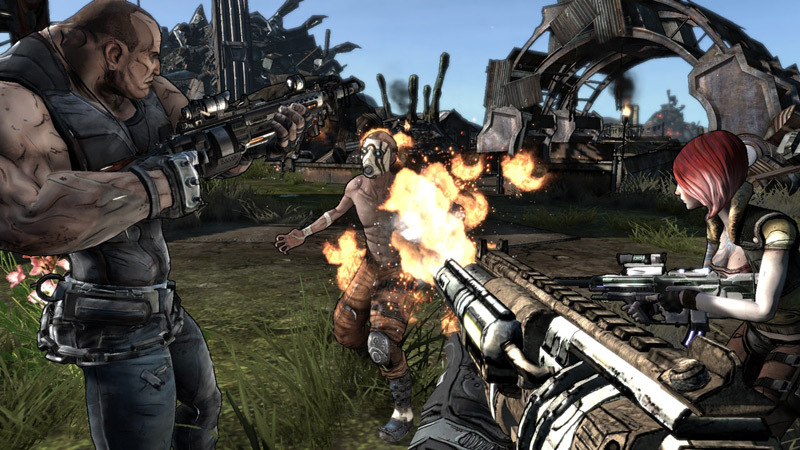 Welcome to Borderlands. This has to be the most loot-driven game since Diablo - all loot in this game has random attributes attached to them upon dropping which leads to some hilarious weapons, for example, a shotgun with a triple-zoom sniper scope: not particularly useful unless you want to carefully inspect your prey's skin complexion before emptying your barrels into their face. You traverse the planet of Pandora, gun in hand, in search of The Vault? What is it? What's in it? Not important! Go about completing quests, earning cash, and buying/finding better gear. Warning to co-op'ers, this game is unforgiving when you have a lot of people (all enemies are beefed up) so you need to make use of your combined firepower otherwise you get very easily overwhelmed. Still not enough to go off? Need more? PART 2 of the Online Co-Op List.